The IKEA Tarva Bed is a bed frame designed as a modern interpretation of traditional Scandinavian furniture that celebrates the timeless quality of simple untreated wood by using it for both the frame and the horizontally slotted headboard. Adding a warm, durable, and natural material to the bedroom, the solid pine wood of the IKEA Tarva Bed can be customized and treated with oil, wax, lacquer or stain as desired. The IKEA Tarva Bed (Queen Size) has a length of 82 1/4” | 209 cm, width of 63” | 160 cm, headboard height of 36 1/4” | 92 cm, and platform height of 11” | 28 cm. The top mattress surface of an IKEA Tarva Bed has a typical height of 21” | 53 cm from the floor if a 10” | 25 cm modern mattress is used. What is the IKEA Tarva Bed? The IKEA Tarva Bed is a bed frame designed as a modern interpretation of traditional Scandinavian furniture design that uses simple untreated wood for both the frame and the horizontally slotted headboard. 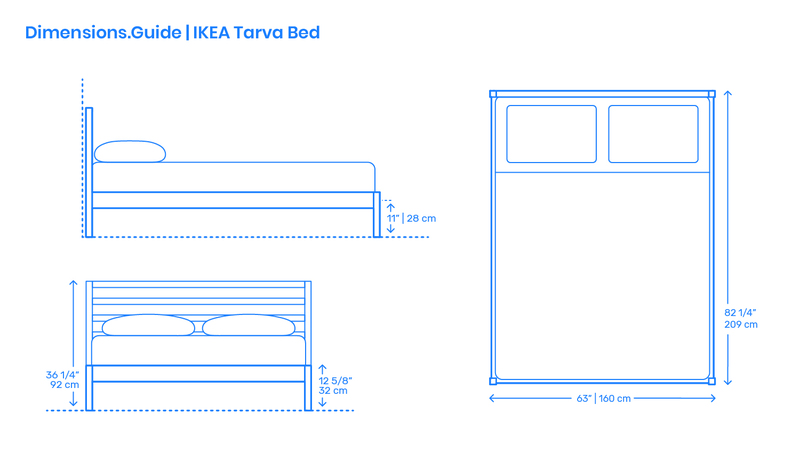 How big is the IKEA Tarva Bed? The IKEA Tarva Bed (Queen Size) has an overall length of 82 1/4” | 209 cm, width of 63” | 160 cm, headboard height of 36 1/4” | 92 cm, and platform height of 11” | 28 cm. How high is the bed surface on the IKEA Tarva Bed? The overall bed height of the mattress on the IKEA Tarva Bed is 21” | 53 cm from the floor if a typical 10” | 25 cm modern mattress thickness is used.